Representing injured victims throughout Henderson and the surrounding Las Vegas area since 1993. The holidays are an amazing time. They are filled with parties, family gatherings, and all kinds of traditions that make it an enjoyable time. They can also be incredibly hectic. With all the events to attend and things to do, the last thing anyone wants is to be involved in an accident. Unfortunately, car accidents, slip and falls and other scary incidents can and do occur during the holidays. 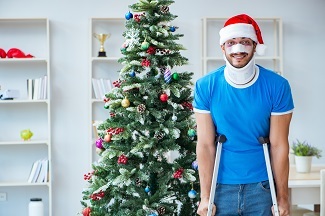 After practicing law for over 25 years I have seen a repeating pattern of personal injury clients around the holidays. One of two things is likely to happen. First, the injured individual will come see me and begin their treatment. However, due to the various activities and demands of their time they will forego obtaining needed medical treatment, or miss so many appointments that they severely prejudice their case. In the other very common scenario, the injured client will not come to see me until after the New Year. They will receive little or no medical treatment, and with a four to six week gap in treatment, they will make their case so difficult that many times I am forced to turn them away. It is unlikely that many of my clients in this situation are going to forego holiday activities and responsibilities. So what is to be done? My recommendation is to at least take the time to consult with an attorney as soon as possible following the accident. By seeking some treatment initially, whether it be an urgent care or emergency room visit or just an initial visit to your chiropractor, you can keep your case intact. If your schedule is such that you cannot follow the treatment regimen recommended by your doctor, make sure to explain the demands on your time and ask your doctor not to over-schedule you until after the holiday demands have subsided. It never looks good to miss scheduled appointments so make sure you are scheduled less frequently and make all of your scheduled appointments. Once the holidays are over you will have more time for yourself to make appointments and focus on getting better. It is always better to take time for your treatment when necessary, but at lease consult with a lawyer to help you preserve your case and your legal rights if you are unfortunate enough to have an accident during the holiday season. If you find yourself injured in an accident over the holidays please reach out to us as soon as possible. Don't wait and jeopardize your claim! You can contact me online or call our Henderson personal injury law office directly at 702.405.6000 to schedule a free consultation. Clear Your Misconceptions About Auto Insurance Coverage. Download Your Free Copy Now!Download Now! ?What are the most common injuries I could suffer if I am hit by a car? ?What should I do if I was injured in a pedestrian accident? ?What are common causes of pedestrian accidents in Henderson?